Have you ever wondered why there seems to be so little scholarship on the Shinsengumi available in English? One may find it surprising, considering all the attention the Shinsengumi get in imported Japanese “pop” culture in the form of films, anime and manga. To date, the only book I know that is dedicated to the study of the “Wolves of Mibu” is Romulus Hillsborough’s Shinsengumi: The Shogun’s Last Samurai Corps published in 1995. On one hand, I have to tip my cap to Hillsborough for writing this book. At least he had the chutzpah to tackle this controversial historical group, and as a result, he’s been beaten up in internet forums for being unbalanced in his approach to the political factions of that day, overly critical of the Shinsengumi by those who adore them, as well as has been accused of writing a book that lacks a coherent flow and contains too many corny and hackneyed phrases. Yet for all of Hillsborough’s faults, both real, imagined or exaggerated, his work remains the only readily available non-fiction book about the Shinsengumi in English. So again, why aren’t there more? I was recently asked this question by a friend and this triggered a serious round of thinking. The following is based on my response. I think the reason why there is so little on the Shinsengumi in English is that in terms of the overall story of the Bakumatsu/Restoration, they are relatively minor players and don’t do anything save one incident which dramatically affects the pace of events. That event was of course, the Ikedaya affair where they pretty much saved Kyoto from deliberately getting torched by some Chōshū nut job extremists. Other than that, what else can you say about these thugs and their brutal behavior towards each other and the loyalist extremists they hunted down? Sorry-- I use the word “thugs” to describe the Shinsengumi, but what other word best describes these guys? I’m definitely no lover of the loyalists, but let’s face it—the Bakufu thought the best way to fight the loyalist thugs that were terrorizing the streets of Kyoto would be with their own “deputized” gang of thugs—and they were right! So while the Shinsengumi may have been minor players in the overall big picture, they do loom very large in the Bakumatsu period history of Kyoto. It would be ludicrous to think that the Shinsengumi did not have a direct impact on the events in that city and everyday life there for a handful of tumultuous years. Again, their impact on Kyoto can’t be denied and is probably one of the reasons they are popular to this day in Japan. Stories and incidents that took place in Edo and Kyoto dominated the mass media then, so we are left with a wealth of material about their exploits in the not so distant past. This is evident by the number of books about the Shinsengumi that can be found on Amazon.co.jp or in any decent-sized Japanese bookstore. One look at my bookshelf further backs this up. Okay, so the Shinsengumi remain a popular topic of scholarship in Japan, but why not in the rest of the world? 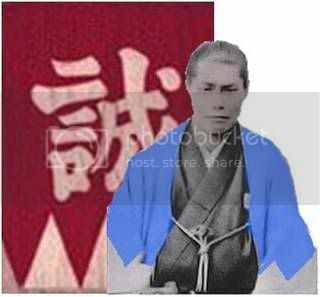 I think you can look at the Shinsengumi’s popularity in Japan and compare it to why a sizeable portion of American society may be able tell you a thing or two from the days of the Wild West about the James Gang or the Dalton Gang on the wrong side of the law or the Texas Rangers, Bat Masterson and the Earp brothers and their friends on the “right” side of the law. In a 20th century context, I guess you could make a loose comparison to Elliott Ness’ G-Men acting as a crack unit to take down Al Capone and the other gangsters of Chicago. Neither the outlaws nor their “good” guy counterparts were angels, but they all stick out and are relatively well known. Americans can tell you about these people and some of their exploits because they were exciting points in the long and bland history of how as a people and a country, the US got from there to here. Also, these people, both “good” and “bad”, were products of the times as well as the culture. They weren’t catalysts or show stoppers in a historical context, but just interesting, and because of this, they are remembered and studied. I don’t think too many non-Americans know much about these people, besides what they may have seen in movies or in old TV shows. I’m willing to wager that there probably aren’t too many non-fiction books published in foreign countries about these historical American figures for the same reason it is hard to find histories of Shinsengumi in languages other than Japanese. Just as many Americans can say that they know the name of Jesse James or Billy the Kid, the same holds true for how Japanese look at the Shinsengumi—whether they are fans or not. Everybody in Japan knows something about the Shinsengumi—even the idiot kids who can’t even tell you the name of the current prime minister! So even though the Shinsengumi are a part of the landscape of Japanese history and culture and are fodder for exciting stories of adventure and dark camaraderie forged in blood, how much interest does a non-Japanese academic or his/her peers have in this topic? I’m not so sure they fully “get it” or find the subject matter all that interesting in the larger scheme of things. If we really think about it, there really aren’t too many books out there in English on the Bakumatsu. I’m already hearing groans from those who already think there are enough books on the Bakumatsu and not enough on the Sengoku period, but let’s face it; there really aren’t all that many books available on Japanese history as opposed to say, European or American history, yes? And most of the books on the Bakumatsu are going to focus on the general big picture or on the key individuals or han, such as Chōshū, Satsuma or Tosa. Thus sadly, for western written histories of the Bakumatsu, the Shinsengumi are nothing more than an interesting footnote. This is one of the problems with non-Japanese scholarship on this period. A lot of the exciting stuff gets relegated to mere footnote status as it really doesn’t alter the outcome of events. Hence, at least in English, the Shinsengumi, for the large part, remain footnotes of history. So, the question is—who is going to write the next non-fictional account of the Shinsengumi in English? Any takers? I enjoyed Hillsborough's book. The fact that they were under the direction of the Lord of Aizu and Aizu was a prominent figure during this time to me makes the Shinsengumi somewhat important to this time as well. Plus, I think it was specifically the Shinsengumi's actions that created the hatred of Aizu among Choshu and Satsuma samurai. This led directly to Aizu's disproportionate punishment following the fall of the Bakufu. While the Shinsengumi did lots of things that didn't help Matsudaira Katamori's popularity with the Choshu and Satsuma extremists, just keep in mind that he held the position of Protector of Kyoto, and had all Bakufu forces at his disposal to keep the peace. The Shinsengumi were really just a cog in the wheel, so to speak. I like to think of them as Bakufu-sanctioned thugs used to fight other thugs. The biggest reason why Aizu was singled out for 'special treatment', however, was not because of the Shinsengumi, but because of the role that regular Aizu troops played in crushing Choshu's forces at the Hamaguri Gate incident in Kyoto. Satsuma, it should be noted, was on the side of the Bakufu at this time, and also was active in helping throw Choshu's forces out of Kyoto. Satsuma's role in the thrashing of Choshu in Kyoto made the conclusion of their alliance even more difficult.